This retelling of a Hindu saga combines the author’s flair for poetic expression with her talents as a graphic artist. The Ballad of Radheya, by English writer and artist K R Sharanya, is a poetic, illustrated version of a thought-provoking tale from the great Hindu saga The Mahabharata. To Hindus, the complex history of the warrior Radheya is well known: he was a child of Princess Kanti, a mortal girl, and Surya, the sun god. The child, born with golden earrings and a shield foretelling his heroic exploits, was set in a little boat and discovered by a humble charioteer and his wife, who gave him his earthly name. When he grew up, Radheya pretended to be a Brahmin and found an apprenticeship with a great guru of warfare. When the teacher learned he had been tricked, he cursed (a Brahmin’s curse will always come true) the young man: at a critical moment in battle, Radheya would forget his warrior’s training and be killed. His eventual death heralded the end of the great wars chronicled in The Mahabharata. Radheya is often cited in Hindu teaching as an example of extreme generosity and loyalty. Sharanya has put Radheya’s story into simple English poetry, mostly quatrains. The verses sometimes work well, but at points, they are awkward, with extra syllables that burden the cadence. The rhyme scheme jumps from ABAB to ABCB to AABB. In the preface, the author states that she has altered certain Sanskrit and Hindi words to fit the meter, as in the name Arjun, or Arjuna. The plot, however, is orderly and easy to grasp, closely following the classical account. The volume is greatly enhanced by Sharanya’s remarkable line drawings. These illustrations, done with pencil, are rich and complex. Expressing both emotion and allegory, they grace the beginning of each chapter. The book’s rather dark, plain cover could have included a color version of any one of these pictures. For the interior, the attention paid to detail is evident; there are four well-centered quatrains per page and an attractive background pattern of an Indian motif in pale gray. 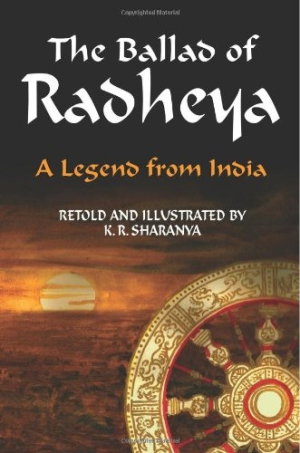 The author of this version of Radheya’s adventures has long been fascinated by The Mahabharata as well as by the poetry of Alfred Lord Tennyson. It seems that Sharanya has created this book to honor both influences. In addition, she is involved in Hindu education in Britain and is working on a series of children’s books that draw on themes from Hindu literature. The Ballad of Radheya fits well into the genre of Eastern religious tales for young readers. With its combination of the author’s flair for poetic expression and her talents as a graphic artist, it is likely to gain favorable attention.